Frederick Brooks (sometimes known as Frederick Currill) was born at 10 Dover's Row, Oxford on 21 August 1897 and baptised at Cowley St John Church on 19 November. the words “perhaps not married” are recorded in the column where the father's name should have been listed. He was the son of Mrs Ellen Brooks née Trinder and she was in fact married at the time, but not to Frederick's father. Frederick’s father appears to have been Mark Currill or Currell (born in Garsington in c.1853), who lived in Barton, Headington (see below). Frederick’s mother Ellen Trinder was born in Bath Street, St Clement's in 1859 and baptised at St Clement's Church on 9 January 1860. She grew up in Charles Street in East Oxford, but her parents lhad been living in Headington (where her father William was born) until just before her birth. In the fourth quarter of 1879 in Oxford, Ellen Trinder married George Brooks (born in Oxford in c.1851), but although Frederick usually carries this man’s surname, he is not his father. Daisy Annie Dorothy Brooks (born at 6 Princes Street, Oxford on 17 March 1894 and baptised at Cowley St John Church on 10 May). At the time of the 1881 census Ellen Brooks (22) was living at Princes Street in east Oxford with her husband George (30) who was a milkman. They as yet had no children and there were two lodgers. Frederick’s father, Mark Currill, was still living in Garsington with his parents at the time of the 1881 census, when he was an unmarried agricultural labourer of 28. By the time of the 1891 census, Frederick’s mother was described as a shirt ironer, and their first three children had been born. Beatrice was only two days old, and a monthly nurse was staying at the house. Their fourth child was born in March 1894. Harriet Currill (born in Barton on 15 March 1895 and baptised at St Andrew's Church on 5 May). At the time of the 1891 census Mark and Emma were living in Barton with their first three children Mark Currill junior (5), Charles William Currill (2), and Jane Elizabeth Currill (1). Their younger daughter was born in 1895. Frederick Brooks (born at 10 Dover's Row, Oxford on 21 August 1897 and baptised at Cowley St John Church on 19 November; also known as Frederick Currill. Ellen Brooks moved up to Barton with her son Frederick to live with Mark Currill, leaving her husband and their four children behind in east Oxford. At the time of the 1901 census Frederick (3) was for the first time recorded as Freddie Currill rather than Brooks. He was living in Barton with his mother Mrs Ellen Brooks (42) and Mark Currill (50), who described himself as a widower and was working as a a groom. Frederick's mother was working as a laundress and Mark described her as his “sister-in-law” and her marital status as single. Mark Currill’s three sons were living with them: Mark (14), Will (12), and George (8), but his daughter Harriet (6) was staying at Wallingford with her aunt, Mrs Harriet Clarke (54), widow of James Clarke. Meanwhile Ellen's husband George Brooks was bringing up their four children on his own down in Oxford. At the time of the 1911 census Frederick Brooks (13) was still living in Barton with his mother Ellen (49) in the home of Mark Currill, who now recorded that Ellen was his “housekeeper” on the census form and at first described “Fred Brooks” as his son, but then scratched this out and changed it to “lodger”. Two of Mark's children were still living with them: Will Currill (22) and Harriet Currill (16), who was recorded as “Tullie”. Meanwhile Ellen’s husband George Brooks (60) was still living at Princes Street, working from home as a dairyman. He stated on the 1911 census form that he had been married for 30 years and had four children, proving that he did not believe that Frederick was his son. His grown-up son George was living with him, together with George's wife Nellie and their children George (3) and Alfred (1). Around the time of the First World War Mark Currill and Ellen Brooks moved together to Highfield parish, where they lived in a small and humble cottage at 65 New High Street. They took Frederick with them. They were never able to marry, as Ellen’s husband George Brooks outlived them both: his death at the age of 89 was registered in the Oxford district in the March quarter of 1940. 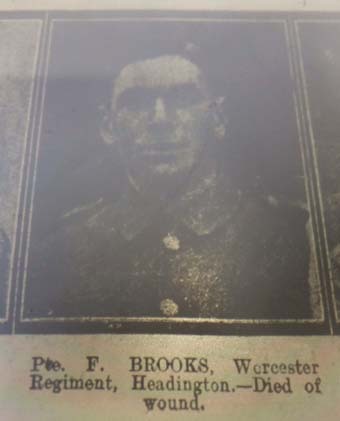 In the First World War Frederick Brooks served as a Private in the 1st Battalion of the Worcestershire Regiment (Service No. 51798). He died of wounds in France at the age of 21 (not 22 as given by CWGC) on 28 August 1918. His effects came to £10 15s. 10d., and this sum together with a war gratuity of 4s. 2d. was paid to his mother, Mrs Ellen Brooks. 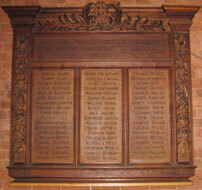 Frederick Brooks is remembered on the Roll of Honour of All Saints’ Church, Highfield. 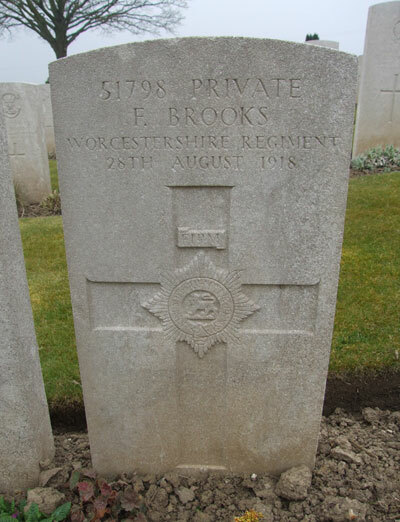 Mrs Ellen Brooks died at 65 New High Street at the age of 74 and was buried in Headington Cemetery (Grave F9) on 24 February 1934. She was described as a widow, even though both her actual husband George Brooks and her common-law husband Mark Currill were both still alive. A Maria Ann Shepherd who died at the age of 75 in 1962 was buried in the same grave as Mrs Brooks on 20 January that year. Mark Currill died at 65 New High Street at the age of 82 and was buried in a different grave in the same cemetery (Grave F63) on 17 July 1935. Daisy Annie Dorothy Brooks (born 1894), Ellen's daughter by her marriage to George Brooks, married Mark Currill's eldest son Charles William Currill in the Headington registration district in 1913.